It has been a dramatic and remarkable few days at the International Criminal Court (ICC). For the first time ever, an elected President appeared before the Court. So concerned was Kenyan President Uhuru Kenyatta that, on the eve of his appearance in The Hague, he took the extraordinary measure of temporarily stepping down and handing over his executive powers to his vice president William Ruto – who, as readers will know, also faces charges at the ICC. Over one-hundred Kenyan politicians flooded into The Hague to show their support for Kenyatta and spent the night in one of the most luxurious hotels in the Netherlands (it remains unclear precisely who paid their expenses). With their evidence either weakening or under attack, the Prosecution asked Judges to indefinitely adjourn or terminate the case against Kenyatta. The Defence asked the Judges to throw the case out altogether. It remains to be seen how – or even when – the judges will rule. While I haven’t had time to blog about recent events at the ICC, I wanted to draw readers attention to two interview programmes that may be of interest to you. The first was for BBC Newshour on the relationship between the ICC and African states. You can find that interview (and the full program) here. I also had the opportunity to speak with UN Dispatch’s Mark Leon Goldberg about Wednesday’s hearings at the ICC regarding the Kenyatta case. You can find that interview here. As always, share your thoughts and opinions! This entry was posted in Justice, Kenya, Kenya and the ICC and tagged Uhuru Kenyatta, William Ruto. Bookmark the permalink. The Kurhaus is approximately half the cost of the Hilton den Haag. It is a budget priced hotel by local standards. Mark, I think this case might show one of the major limitations of the ICC in the quest for its holy grail – the prosecution of a sitting head of state. Rarely (well almost never) will a defendant have the resources, power and influence to defend themselves. It’s hard to see how the prosecution can compete in these circumstances. The Kenyan cases have been overly politicized and dramatized. Notwithstanding that, criminal justice does not stop at the interests of the victims. The accused also, as a private person, has rights under the Statute (For example Articles 55 and 67(1)(c) of the Rome Statute). Clearly, the Prosecution has no evidence. It has no statutory provision, nor jurisprudence to support its request for sine die adjournment. The evidence being sought from the GoK at the moment is speculative. For the interests of justice therefore, the Prosecution should act accordingly under Regulation 60 and terminate the case, that is, without prejudice to future investigations or prosecution. Not that I’m endorsing the supposed lack of cooperation by the GoK. Far from it, should the Chamber find that there is indeed lack of cooperation, the matter should be handed over to the ASP. Personally, I think the Government is somehow dilly dallying. There are avenues under domestic law within which the documents requested by the Prosecution can be obtained. But having regard that ‘the accused’ is the only person who can fire the Attorney General, there is a conflict of interests here. The GoK is in no way going to cooperate in matters relating to Kenyatta’s private records, even if he was not President. The legacy of Jomo Kenyatta would still shield him from such intrusion into his private life. That is how Kenyans work. A sine die adjournment would therefore not be beneficial to anyone in this case, it would only keep the Court’s resources in use, with no prospect whatsoever of securing a conviction ‘someday’. 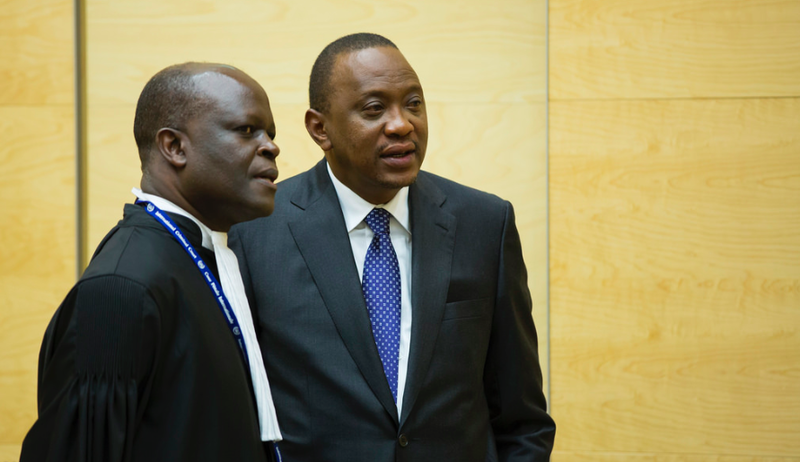 What next for President Uhuru Kenyatta, Kenya and the ICC? Thank you Mark for this update on the ICC. Last year I wrote President Obama about Syria and the ICC, and got a response March 12, 2014, see attached. Also attached is evidence of my unsuccessful efforts to get a response from the United Nations in a separate matter. Sometimes I think a “United Peoples” might be a better approach than the “United Nations”. People, not nations, are the ultimate decision makers in the Rule of Law vs. war and lawlessness. Mark, here are links to President Obama’s letter on Syria, and my letter to the UN. 1. The president did not step down. And he did not hand over power. That all was a shenanigan, offensive to any constitutional jurist because it was so obvious and transparent. But the audience had paid for a circus and thus greatly enjoyed the clownery, clapping hands and cheering. In reality, the Kenyan constitution – like many others – provides that the deputy president automatically acts in lieu of the president when this one is absent. It is a self-executing norm. You have all been duped. Incidentally, Prof. Makau Mutua has also explained this issue on Kenyan TV currently; it was nothing but a cheap propaganda spiel. 2. The serikali (Kenyan government) is NOT “dilly-dallying”, as Orina Moraa duplicitously tries to misrepresent it. They are, on the contrary, very active with a clear aim. It is the government that intimidates (at times, also bribes) witnesses, has already killed several of them (and two high-ranking politicians were thereupon assassinated by Kenyan Police in due avenge), has used corrupt judges (Kalpana Rawal) to block testimony, and is destroying and forging evidence. The OTP has amply related on forged evidence. See filing # 892, annex. 3. The prosecution still has a heap of evidence in its hands, thus the denial of O.M. is simply against the facts. In a civil law proceeding, the remaining evidence would apply suffice to win the case. But in criminal law, the standard of proof is higher. The whole existent and severely incriminating evidence is listed succinctly in the status conference transcript on pages 35-38. Read that, Orina, and learn. 3.a. This list however is taken only from one of two mounds of evidence. The *second* mound has not yet been mined; but it would be the real “Cerro Rico” and could easily send the accused into jail. That is the reason why one of the paid journalists of the accused (Oliver Mathenge) betrayed himself in a sudden panic attack, when publicly commenting on the Appeals Chamber decision of the immediately following day (9th October). He wrote that he feared that this new decision could sway the case of his boss. As I noted above, this second part of the evidence – and there is a lot of it – had temporarily been estopped in the corrupt Kenyan judiciary via a High Court injunction. It was delivered as ordered by government. The subservient stooge on the bench was subsequently promoted to the post of Deputy Chief Justice of the Kenyan Supreme Court (after having done still one more service against justice, as later requested in addition). 4. OTP’s performance (Ben Gumpert) was downright catastrophical in the first part before the noon break. I have explained in another place the possible reasons, but my take might just be a bit too sarcastic for Mark’s diligent seriousness. As I must add for truth’s sake, defence barrister Steven Kay was also caught with trousers down; judge Henderson’s pertinent questions on procedural law and dogmatics make both of them look rather bad, unlearned, and most of all, very very unprepared. The only person who was well prepared, was Fergal Gaynor as victims’ representative. He carried the day. Mark, you were reblogged on opiniojuris and were even slobbered all over by an adulatory Kevn Jon Heller who would not contain his outbreak of mirth. I can see the glistening saliva still sticking to you. I am not 100 % sure whether I would take that as a compliment (academese expression for : “I would be lightly ashamed, and would ask myself what wrong I have committed”). But when, eventually, an anonymous $ 10,000 cheque arrives at your domicile address in an envelope postmarked Nairobi, then you’l know that you are on the “right way”.